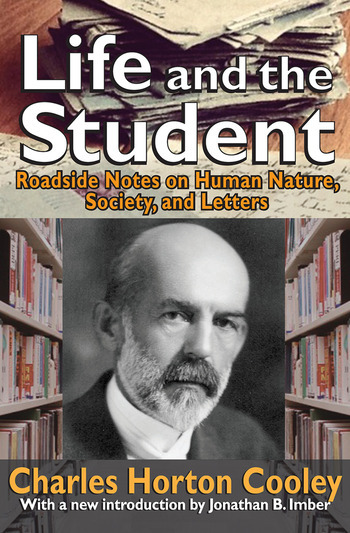 Life and the Student (1927), with a new introduction by Jonathan B. Imber, is a compilation of reflections, commentaries, and letters from other scholars that Charles Horton Cooley, accumulated throughout his life. The book includes personal passages on various topics within the realms of reading and writing, thinking, art, science, sociology, academia, religion, and human nature. There is no formal structure to the book, except the literary sense that organizes these thoughts and observations about life. It is impossible to categorize these widely ranging commentaries. They include discussions of the automobile, the impressionable nature of young people, the claim that the question of racial superiority is still unresolved, his belief that eugenists are inconsistent in their views, and more. Cooley's work sought to emphasize the connection between society and the individual. He believed that the two could only be understood in relationship to each other. While researching the effects of social responses and social participation, he created the concept of the "looking-glass self," which is the theory that a person's sense of self grows out of interpersonal interactions and the perceptions of others. Cooley also showed that social life and the relationship between groups and communities stems from mental phenomena. — Class-Conflict —Rural Physiognomy — Progress? Ideas about God — God and Oneself — Seeking God — Another Life?